A French band with a very distinctive sound centered around Roland Bocquet's ghostly Farfisa organ. Their first album (recorded March 1971 at Studio ETA) was a mixture of easily accessible tunes, strange wordless chanting, high hippie spirits, Arabian elements, strong percussion and a few avant-garde excursions. Their music had a very spontaneous feeling, as if the group was assembled for some kind of occult ritual using music to reach a higher consciousness. Arguably they had some common ground with the early Pink Floyd and Amon Düül philosophically, but it lead to other conclusions musically. Masq is also notable for its surrealistic cover design. Three members quit the group before Les Chevrons (recorded December 1971) but their sound didn't change much. There were more tracks and they were more compressed (giving way to more melodies), but this didn't spoil the characteristic spontaneous feel of their charming music. Quite a lot more material was recorded in 1971, but not released until 1975. 32 Mars contained the title track in a long (11:30) and short (3:06) format, in addition to the tracks "Masq" (a hit single in France) and "Les Chevrons" in alternate versions. Clocking in at just 23 minutes it was short even for French albums of the time. Illuminations contained recordings from June and November 1971 featuring Charlotte's distinctive chanting on many tracks. Her academic vocal training shines through (the members were former music academy students), sometimes close to Donella Del Monaco in Opus Avantra. The musical variety was greater than before, ranging from the trancendental "Aube" via uncommon treatments of music from the 17th and 18th Century, to the childish "Mignonne Allons Voir". Among these short pieces are some of Catharsis' finest recordings. For the next two albums, Catharsis reduced themselves to background musicians for Bernard Verley's spoken, sung and sometimes bellowed recitations of verses by Rimbaud. However, the albums are good in their own right. 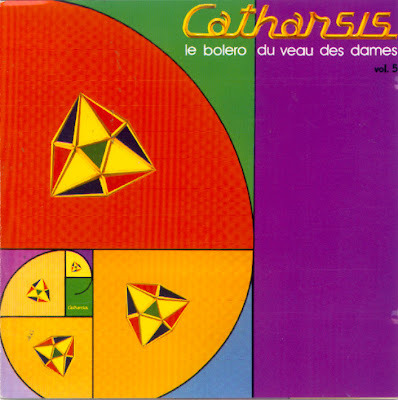 After a break, Roland Boquet introduced a revamped Catharsis line-up in 1975. Lei Boléro Du Veau Des Dames was a more down-to-earth effort containing rather ordinary instrumental music similar to the better movie soundtracks. This was nice background music but lacking a bit in intensity. Spalax skips to the 5th album, from 1975; by this point the sound is nondescript organ-led rock with mid-70s progish touches.